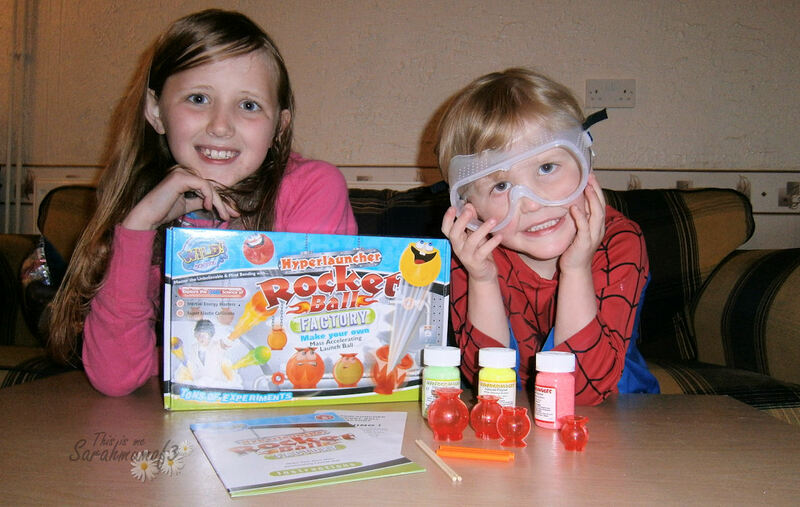 This is me Sarah mum of 3: Making Science fun! 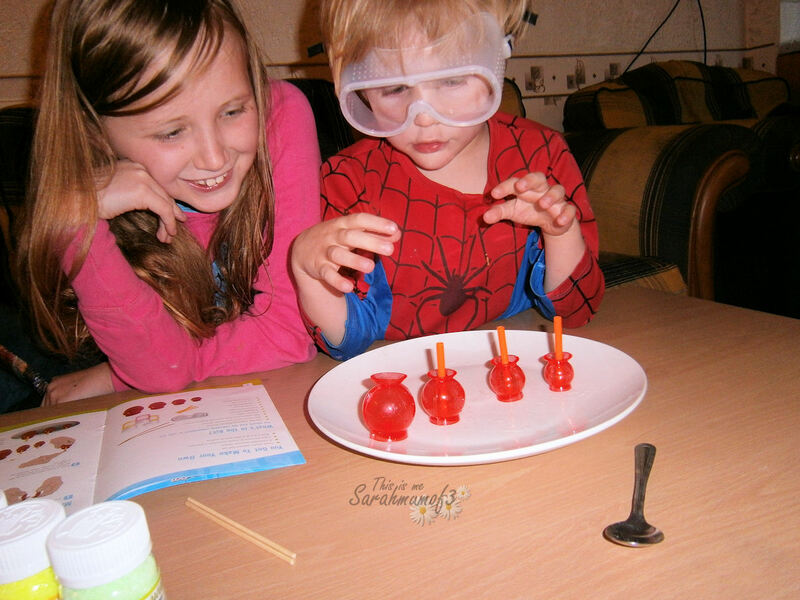 I mentioned a few weeks ago I was attending a family learning Science course at my eldest children's school, the course aimed to make science fun and engaging for both adults and children, and having parents there learning along side the children is a great way to focus attention and encourage them to take an interest. The course ran for 6 weeks and we all really enjoyed it, we did plenty of fun experiments simple things which made us look at how science is present in so much daily life and it can be fun to see what makes things work the way they do. Now the family learning course has finished, and it the Easter Break I was really happy to be offered a Wild Science Hyperlauncher Rocketball activity kit to review, perfect timing to keep our spark for science going through the holiday. This kit is aimed at 8 year olds and above, however my 4 year old managed to join in with my supervision. 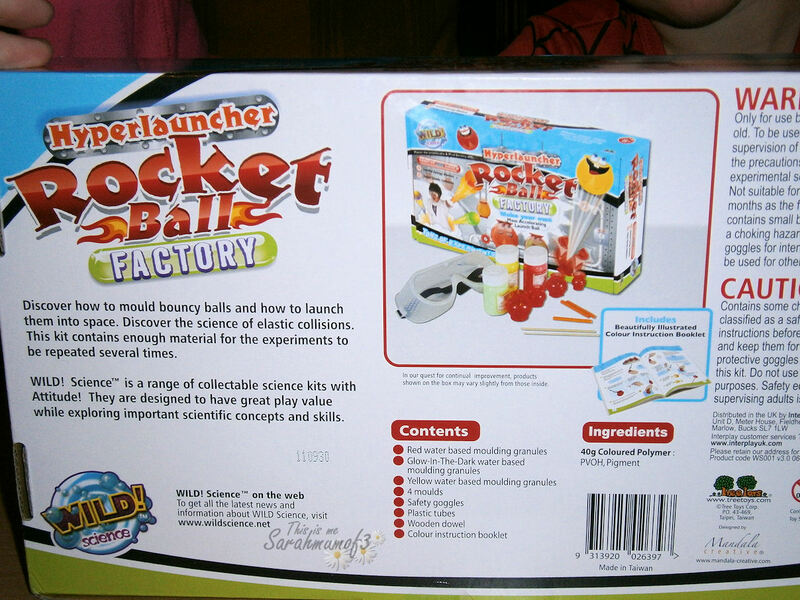 The idea of this kit is that you get to learn about inertial energy, and elastic collisions, or to those with less scientific terminology - you get to make and see what makes bouncy balls bounce, and how momentum and force effects movements! This is a bright coloured box which instantly grabbed the attention of all three of my children. Inside the box you are greeted with everything you need to complete the experiments, the only additional thing you will need is a bowl of water. 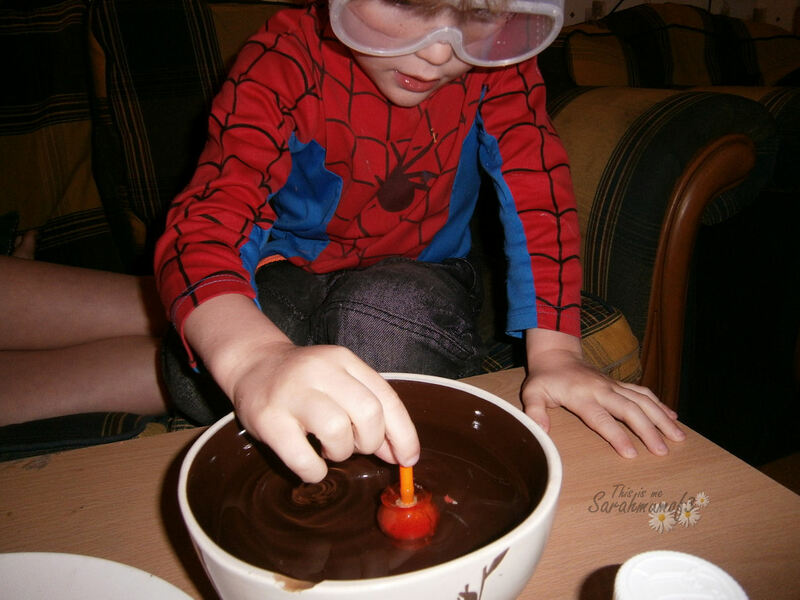 There are several tubs of crystal powder, 4 different sized moulds, some plastic rods, and the all important scientific goggles! The instruction booklet, is beautifully illustrated with the same appealing colourful designs as on the box, the simple instructions make it easy enough for older children to follow alone. 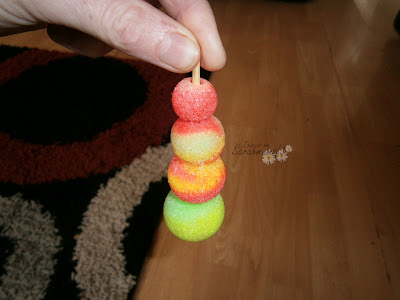 Making the balls themselves seemed to be the fun part for all three of my children,The simple instructions meant they could all be included with no need for too much help from me. 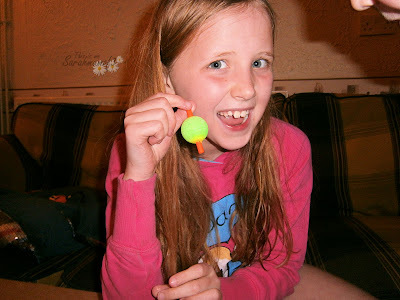 Included in the kit is several colour crystal option including a glow in the dark variety, so picking the colours of the balls was part of the fun. 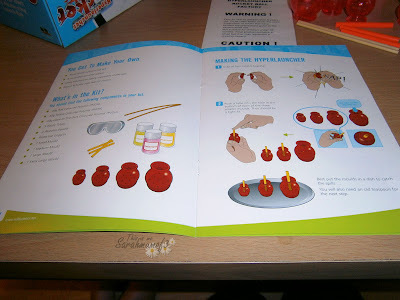 Then putting them under the water before taking the moulds off and hoping the balls were correctly formed. We only had one which didn't hold together as expected (I think we were a little eager to remove them from the water) But all others worked perfectly well, and there is plenty of crystals to make several sets of balls. 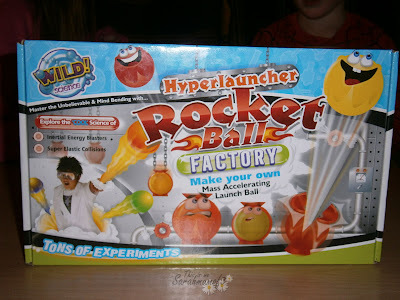 Once the balls were all made, the children happily used them as suggested in the instructions, watching how the balls reacted to being dropped when all connected on to the 'hyperlauncher' watching as the small ball bounced off the rod leaving the others remaining, we talked about the law of motion and they changed the order of the balls on the hyperlauncher to see what happened then. 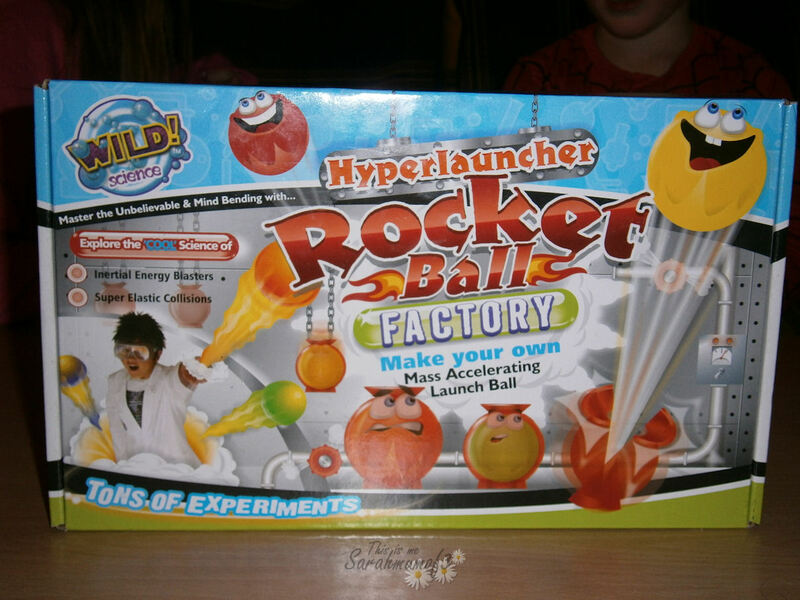 The children loved making their very own bouncy balls, and after playing with the 'hyper launcher' they enjoyed simply bouncing the balls between themselves and making them glow in the dark. 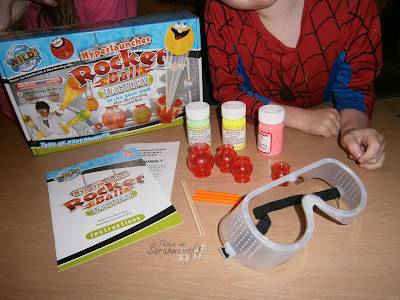 Overall this is a really fun kit, simple and easy to use, with very little mess and older children can mange successfully alone with ease, younger children can enjoy this kit too with a bit of adult supervision. The end output is great, so no disappointment caused and there is plenty of options to include lots of educational talk and scientific knowledge making learning whilst having fun easy. oh yes they aren't really needed in terms of safety but they are very much needed to make you look the part!